Mr Ripley's word of mouth book for June. Covers the subject of world war in a new concept for children and teachers. This book really started in a primary school classroom, over thirty years ago. Second World War. At first I was a bit cross at not having a proper story - but soon I was absolutely riveted. I t stirred up an interest in World War II - and especially life on the home front - which has endured to this very day. Now, when she said that I didn't exactly jump up and cry ' Eureka' but I tell you, I came pretty close. Researching this book has been a special pleasure. I've loved, too, constructing a twisty plot, which asks questions about both life then and now - and I hope too, it shows the past isn't quite as faraway from us as we might think. Zac and Izzy win a place on a new reality TV show, but they have no idea where they're going or what to expect ...They must live as if it's 1939, the start of World War Two. One by on they will be voted out by the viewing public. It's a hard life and, desperate to be the final winner, problems occur. When the live final arrives, the contestants and the audience will all be stunned by what occurs. 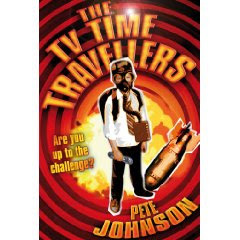 PETE JOHNSON began work as a film critic for Radio One, then became a teacher. His experiences in the classroom led to his beginning to write and he still keeps contact with a panel of young readers to gain the viewpoint of the actual reader as he writes new titles. He is the author of several titles for the Corgi Yearling list.